This app is disappointing. I compared there numbers to various websites and found it to be inaccurate. I am not able to cut amounts in half either. This in-app my coach purchase is bull crap. I realize the developer has to make a living. Ive chatted with him several times. You couldn’t meet a nicer dude. Personally I hate the in-app my coach option. I really wish they would’ve made a separate app. For paid users like me I hate tabs that are unusable and only being dedicated to BS in-app purchase crud. I don’t no how successful the nutrition algorithm is, but for $10 bucks a month I’m not sure I wanna find out. This app is so easy to use. It does all the work for you! I don’t like diets and I don’t like counting calories, so this has been wonderful. This app came highly recommended. I was looking for something to replace MFP that let me get better customization of my macros. I can’t believe I paid for this app that has almost zero functionality. Great I can customize my macros down to the each’s, but I have to enter EVERYTHING else. The barcode scanner works, but almost all of the information was entered incorrectly. The nutrition label scanner almost never works, yet I keep trying. Most recently it told me my creamer was 2 calories but 80 grams of fat 🤦‍♀️ I’ve learned not to even open the database, because google is more accurate if I’m really unsure. And the worst is despite entering something as one serving, when you go to quickly add it to your day, the default is one of whatever the measurement is. Enter one serving as 15g, but quick add will default to one gram. It’s super frustrating and makes me miss the free MFP. Save your money. Won’t even allow me to log in! Heard a lot of good things about the macro tracking and figured it was worth the 2.99. WRONG! If you create an account from their website, good luck getting the app to login to that account. I had to reset my password multiple times only to come to a conclusion that it’s just not going to work. Hopefully apple will refund me for a dud! How does this have such a high rating? Essentially this app which isn’t free offers a monthly service for something that is free on my fitness pal. My fitness pal was draining my battery so I downloaded this hoping it was worth it. Used it for 5 minutes. This app is very difficult to navigate around. It’s hard to figure out how to change the units in which you measure your food. MFP at least makes it easy to change from oz to g if you wanted. Worth the small fee. Well done! I’ve only had this app. for about an hour and I’ve already set my macro. goals, added all of today’s meals and water, and used the barcode scanner to add the foods that I frequently eat. I can already tell this app. Is amazing. I will be recommending it to friends. Thanks!!! The app so far is about 3 stars, issues when you are sliding back and forth between the meals and scanning or adding food items. When you slide back and forth it thinks you are trying to delete or change an item because it is so sensitive. Initial use. I find this very frustrating to use. RIP OFF! DO NOT BUY! I paid $2.99 for the app thinking that was it. When I opened it up, it would not let me go any farther than putting in my information without agreeing to pay $9.99 a month. I’m so sorry I wasted my $2.99. Don’t buy this unless you’re ready to commit to another $9.99 a month. Use a different app!!!! This is a disappointing purchase. Please refund. This app is perfect for tracking macros, especially when I’m cutting. I love the app. How do I log out when I’m not in the app? I found this app to be much better than some of the other ones out there. The bar code reader worked well for a lot of my items. I was able to customize the meals I commonly eat and add them so that I don’t have to add every little ingredient. When I had one challenge trying to figure out how to get things synched, the developer contacted me very quickly and provided just the right answers. In the world of less than great apps, this one is awesome. This app is very helpful with accountability and accuracy. I recommend it to beginners and aficionados alike. I saw the high ratings for this app and as it was recommended by Bulletproof as a great way to track macros, I was excited to download it. The app costs $3.21 just to download and in order to track your macros you are required to subscribe for $9.99 per month — outrageous. Beyond tired of greed & deception when people are simply trying to correct their health. Shame on you. Love this app but I’ve noticed I have to correct a lot of the nutritional values after scanning a barcode. Luckily, it’s fairly easy to change but just kind of a hassle at times. Other than that, I really LOVE this app. The best macro tracker I’ve used so far. NOT WORTH $2.99! I’m talking if you want the absolute basic of all calorie trackers, by all means please download. However, there are no features at all. You looking to set goals in the app for macro percentages? You can’t! You want to get recommendations on macros for bulking or cutting? That’s an extra $10 a month. I don’t mind paying for an app, but don’t force people to pay for something that free apps already offer them attempt to rope them into paying more for the features that are worthwhile. You’re just money hungry, not at all looking to serve the people who place faith in you. I've tried to cancel my account over 5 times. And they still charge me. It's been 2 years since I've used it. This app is horrible unlike my fitness app your only allowed to add one thing for your meal. Way to confusing. At this tome I don’t have half a day to figure out how to use this app. I’m more upset I wasted 2.99 on a app then you want 7.99 per month. It will be a great app in the future! These app developers are scam artists. If you want to try and cancel your subscription they make you download a tutorial as to how to actually cancel - it’s a huge pain. It’s almost like they knew their app was bad and so let’s just make it really difficult for customers to cancel so we can at least get one more billing period off them while they try to figure out how to cancel. How possibly does this app have all of these positive reviews? They can’t be real reviews because no matter how many times I come back to this app it is completely unusable. Scan an item? This app won’t have it. Guaranteed. Scan the same item in MFP and it’s there. Scan in any other app and the item is there. But not MyMacros. And the user interface is ridiculous. Impossible to wrap your head around. Just terrible. Can’t give it any less stars. Not user friendly at all . I like the way it’s interface is displayed and how it tracks my fats, proteins and carbs in a visual chart. Part of me wants to subscribe to pro but it doesn’t feel worth it. It claims to have all these food options but on the first day I ate at a restaurant and couldn’t record several items. It didn’t have many of the Girl Scout cookies on there even though they had a category for them. Feels incomplete. Should be integrated with Apple’s Health App. Everything else is why is this? One star because I can’t give a zero. Simple, there are better apps that are cheaper. 1st you have to pay just to download 2nd what you get with the download isn’t any different from what you get free with any other calorie counter / macro tracker. Honestly I just got ripped off and would like my money back. Your buddy to keep you accountable. I’ve been using this app for well over a year and I can’t say anything but great things about it. 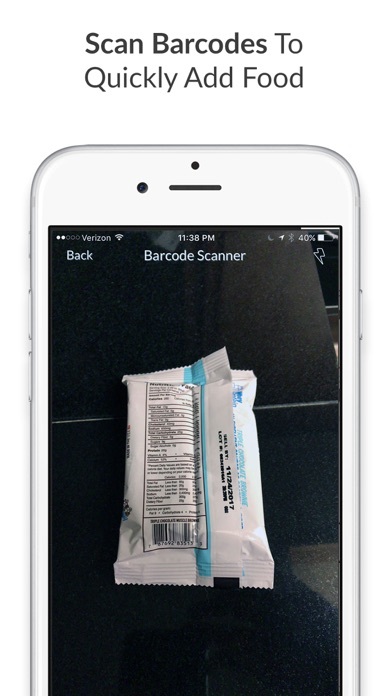 With the updates of nutrition scans and barcode scanners, it just gets better. It’s helped me be accountable and it’s easy and fast to use, even with the Apple Watch! I won’t use another app for macros-sorry. This is the best. Not a fan. You have to pay to do everything in the app after buying the app! This app is awesome, I am 100% happy. I will always use this app to track my calories and macros. I love this app! I’ve been using it for about a year now to track all my macros. It’s even easier once you start adding all of your recipes and custom foods. I purchased this app hoping it would give me more than the basic macro count and was sold that it states it has a data base of foods with nutritional value already calculated. Well, I rarely found the information correct if the database did find the brand item I was looking for. And maybe it was user error but I couldn’t even find the correct numbers for simple things like a bell pepper. Also, It’s not user friendly. I found it hard to use and the overall annoying. I have since started using a different app and it’s a world apart from this one. 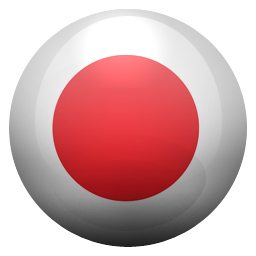 A reliable, streamlined app the serves as a fantastic tool for everyday macro counting. After paying $2.99, I found this app not useful at all. Great idea, but I can’t enter my macros and info without paying $9.99 a month. Definitely asking for a refund back since there’s other apps that allow you to enter your macros and keep track of them. Very difficult to figure out how to use it; very unfriendly. I simply want an App to log what nutrition I generated from the food I ate, simple like that. The food are all over the place, too many info makes it a mass. I tried 20 mins, wasted $2.99, bye-bye. Won’t use it again. I wasted my money because this came highly recommended by Dave Asprey (Bulletproof Diet founder). I used this alongside nutritionix to see which would be better and to see the differences/similarities to ensure I was consistent. ANY macros app that can’t address NEGATIVE net carbs should be held accountable and shocked to find out this exists in their database. After multiple interactions with customer service, they’re just like “meh, don’t care.” The only reason I gave this one star is because, unlike nutritionix, they let me know how much of a gallon I’ve drank (i.e. 0.77 gallons) versus just ounces alone....which I know is 128oz in a gallon....suffice to say, not impressed! Wanted to try something new. Not at all impressed and wish I didn’t pay for it. My Macros + is easy to use & navigate! If i have any issues customer service is very prompt & helpful. They are always ensuring the app is up to date with new features. I have literally tracked my food (almost) everyday for practically 3 years! Keeps me in check!! Seriously a great app. I like it much better than MFP. I’ve been using it for a over a year and the customer service is great! The only thing it’s missing is the ability to sync to Apple health! 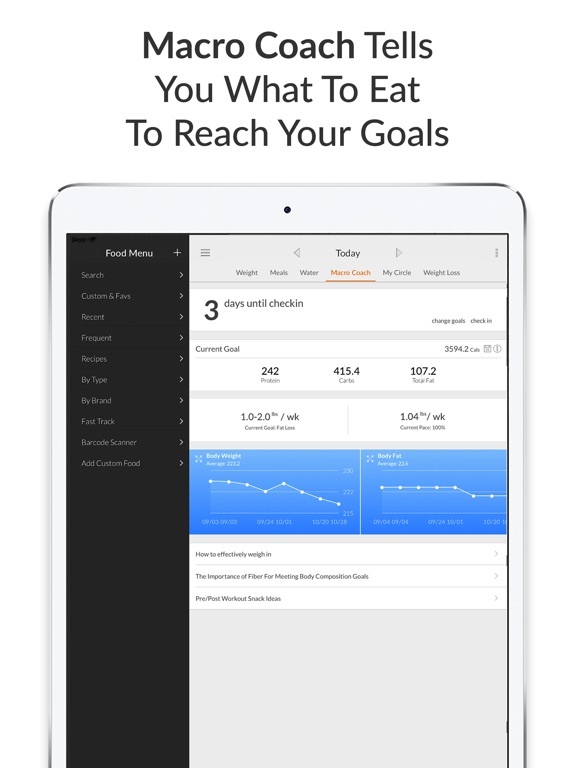 If your goal is to set and track daily calories/macros, this app is phenomenal. The databank can be a little lacking, but the ability to enter custom foods and recipes means you can account for just about anything you eat if you want to. The recent and frequent food options are super convenient. It may seem tedious to enter a lot of foods at first, but once you build a library of foods you regularly consume this app really shines. I absolutely love this app and it is fundamental for my fitness journey!! I’d avise anyone who wants to own their healthy and fitness to download it! I have had this app for a while but I am just beginning to really appreciate how powerful it really is. Everything that I have needed to track that I could not track before in other apps I can do it here. I can add custom recipes, rename them, put them on a different day, add notes to them, and get a meal reminder. I can even add custom meal names so that I really know what I’m tracking instead of trying to force it to fit in standard categories like other apps. What more can a girl ask for? Now if I could just have this app to do my cardio for me I would be all set😄! This app is not user friendly and I want my money back. This had a coach, and calculator, that if you pay an additional 10 bucks a month you can use. So I just paid 3 bucks for the app, and it won’t even calculate my macros that I should be eating, unless I do a 7 day trial that will most like turn into me paying $10, because it won’t get cancelled correctly or until after the due date. Not what I was looking for. I have been using this app for almost 5 years and I LOVE it! Not only is the app great, but the customer service is top notch. I accidentally deleted my whole food library after getting a new phone and Jason emailed back in less than 30 mins with a solution. Thank you so much Jason! I have been using My Macros for a couple years and have never had an issue with the app until today when I went to log in info and all my data was gone. I emailed customer service not expecting to get a response but within a couple hours I had heard back and the problem was resolved in minutes. Impressive to say the least! The time I have spent logging my food since switching from MFP to MM+ has gone up immensely and I’m tracking way more haphazardly because creating recipes is nearly impossible and bar code scanning vegetarian protein and yogurt is mostly useless. These applications should make it simpler, but I have to create recipes in MFP and transfer the macros to this to even use it! Unless you are eating plain meat and vegetables, don’t bother. Okay I know the overall rating is really great because that’s what got me into buying this. But trust me, don’t buy it unless you have a lot of patience and a lot of free time. It takes a very long time to add food, adjust serving size, change units, etc. Most of the time you can’t even be positive it’s correct because food is measured in grams, and I’m obviously unable to carry a scale around with me everywhere I go. Even at home I’m not weighing my burger/salad/pasta/avocados. It’s not user friendly and way over complicated. I feel like it would be easier to just keep a hand written log instead of buying this. Many brands don’t show up and app layout is awkward. “My Fitness Pal” is still my favorite and it’s free! Food search database is not easy to find what you are eating. The size of the servings is not the same as the nutritional label so a lot of calculating or searching for how much you actually ate. And all of the “cool” app features require money. Why are daily notes part of $5 a month charge??? Why can’t I use graphs for carb progress or weight progress with extra money? I understand coaching and advice, but the rest??? What is it extra money for graphs and being able to take personal notes or diaries? Really easy to use and a great database. The only reason it gets 4 instead of 5 stars is because the new nutrition label reader doesn’t seem to work. I signed up for a free trial so I could have the help with calculating my macros. The food library is not very big. The app is clunky and hard to navigate. To top it off, it took me more than 5 minutes to figure out how to cancel my free trial subscription so that I wouldn’t be charged. Definitely not worth the $9.99 upgrade. Lots of room for improvement. This thing was impossible to use in relation to calories and macros. My plate app is way easier, straight forward and does what you need. Deleting today. If you are completely paleo this would be a good to but very difficult to find specific brands of foods. Used for about two weeks and went back to MyFitnessPal. I am canceling this less than 5 days after purchase. Wasted time and money. You have to pay for this app when it literally does less than my fitness pal! Ranked No. 4 for Health and Fitness is no surprise. Great job creating this extremely useful and beneficial app. I can’t begin to tell you how happy, and excited I am to have found this product. It’s so much better than expected. Not only is the user experience terrible, the food database is garbage. When I typed in “cod”, nothing came up. When I typed “cod fish” it gave me macros for “dog fish,” whatever the hell that is. Terrible! As most reviews will tell you; this app is a general letdown. It is inflexible in portion selection, it requires you to pay a monthly fee for basic TDEE calculations, the scanner and label reader barely work, and BY GOD is the search awful. I mean, there is literally NO natural language parsing. Let’s say in MFP or MyNetDiary you want to search for some food from some brand. You’d type in “nuggets McDonald’s” and probably get Chicken McNugget as one of the top results. Assuming you had the foresight to type in the proper, exact name of what you want in this app. You can only search the food, then use an antiquated list to navigate poorly to which brand you might want. Even the universal search is pathetic. Worst of all: the support is terrible. I had a log in issue that prevented me from using the app again, which thankfully led me to MyNetDiary in the interim. It took 2 weeks and multiple check ins on my behalf just to get the log in issue resolved. This should have been a 2-3 business day issue at most. Look elsewhere. They keep the old reviews up because they’re from a time when this actually was one of the better macro apps. Installed the app and decided to return it right away but they just ignoring my refund requests and email messages. This app follows no standard iOS design patterns. You’ll need a book to figure out how to use this thing. MyPlate is way better. Easy tracking will continue to use. I have entered foods into this app several times (which is VERY TEDIOUS and time consuming) and had a list going. I haven’t used the app in a while and now all of my saved foods are GONE! This has happened more than once, so now I’m not sure if I want to waste time entering all the info for a THIRD time! I’M SO FRUSTRATED WITH THIS APP!!! And contacting them? Forget it, there’s no contact info within the app to provide feedback or get help (if there is a way, they’ve hidden it very well). If you are wanting to manually enter every single nutritional fact about every food you eat than this app is for you. Unless you buy every single meal from a restaurant you will have to put in the nutritional facts and find out how many servings you ate or plan to eat. If you want just about every food homemade or from a restaurant use my fitness pal. Much more friendly and free. This app is amazing!! Took a couple of days to get used to but now I absolutely love it and can’t imagine not using it! (⭐️⭐️) Dec 2018 Updated Review: I love this app for giving the option to track macros upfront and free, that option alone makes this app a cut about the others. It doesn’t come without its share of issues. With the new updates it seems that they are just adding features without correcting preexisting bugs. I’ve been a user of this app for close to 2 years... here’s my updated review a/o Dec 2018. - Barcode works for time to time BUT it will appear to have added the food to your day and then after a few short seconds your data is skewed bc the foods added via barcode disappears. This could cause you to overeat if you’re not checking to make sure your foods actually stayed and were deducted from your macros - Day Streak.. just randomly resets to 0 after about 3 days of logging. It’s annoying - Micronutrients aren’t readily available to view - Most Foods aren’t found OR the naming of foods are so off that you’re having to continue to create new foods in the database. This is especially annoying for a flexible eater or when eating on the go. - Had to find friends and share data while using this app so it makes it harder for group nutrition challenges Based on the issues listed above, I will more than likely switch to another logging app until these issues are updated. As a competitive bodybuilder, I can’t accept the inaccuracies with this app during show prep. ————————————————— (⭐️⭐️⭐️)Below is my original review. Let me start this review by saying in comparison to the "other" apps of its kind this is a 5 star app BUT......After the 2 Dec 16 update I will admit that there have been issues now with the barcode scanner. It will time out after taking what seems like forever or never actually come up with anything. Same issue with the search function. The database has gotten bigger and it's well worth the money paid for this app. The update that caused the issues with the search & barcode feature are the reason for the rating. 🎯🎯🎯🎯🎯🎯🎯🎯🎯🎯🎯 (⭐️⭐️⭐️⭐️⭐️)I love this app.. I measure my food in grams and ounces.. Search feature is a bit weird but the barcode scanner works great. If there was a bigger database I'd give 5 stars! Not sure if it’s me but nothing matches labels that I scan. Constantly having to manually enter all my foods. Going back to My Fitness Pal app. Very complicated and frustrating to use..
I’m coming from MyFitnessPal, I was a long time user of theirs but I kept hearing a lot of great things about My Macro+ so decided to give it shot. First off, this app is extremely frustrating to use, the app has the ability to scan barcodes, scan nutritional labels but it is usually a hit or miss with more if not all of the labels I have scanned... so guess what that means? You have to spend more time inputting the whole label for the foods you ate. The app claims that it has over 5,000,0000 codes in its food database that should pick up when you scan an item, but since I’ve gotten the app it can’t even pick up some of the most common brands out there. Secondly, you already pay 2.99 for the app, the application doesn’t give you the ability to track your macros such as Proteins, Fats and carbs for free, this is a paid feature of the application which makes the application completely useless to me. Not happy with app, and I definitely wouldn’t recommend it if you are coming from MFP. I can’t cancel the subscription. I tried via Apple and online. Neither support a cancellation request. I have contacted customer service three times. 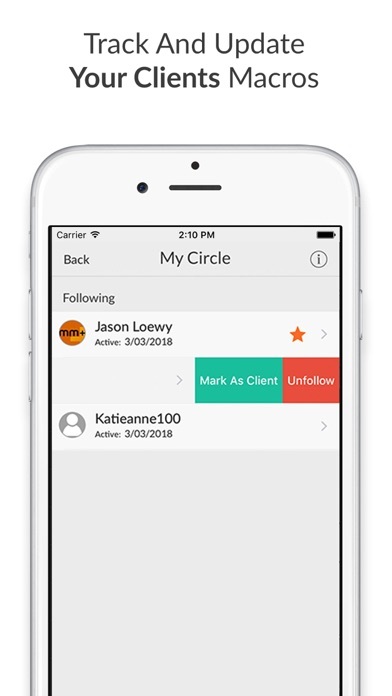 My circle doesn’t update and keeps deleting. Also, receipts are slow to show up. Seems most Foods like from restaurants not there. Your app is garbage. Forget trying to login after getting a new phone. There is no way for me to email the developer because I’m not logged in, but I need help to login!! I try to get a password reset and the way the app is setup I can’t even enter info in the fields to request a reset! It asks for a verification code and there’s no way for me to even enter that into the fields. So yeah. Talk about a couple bucks wasted. I have been using MyFitnessPal for years, but wanted something with more customization. I love that this app allows me to set different macro goals for different days, and has more than just the typical three meal set up. However, the food database is seriously lacking. It’s incredibly difficult to find simple foods, and I’ve ended up adding almost everything so far as a custom food. Lucky for me I eat essentially the same thing every day, so after adding a food I can easily add it from the recent list. But it’s still a hassle initially. Also, the barcode feature is hit or miss. There have been several times that the product couldn’t be found, had info completely different from the box, or brought up something similar but not exactly what I was looking for. Which, again, leads to me going through the process of adding a custom food. I will continue to use this app for the simple reason that I paid money for it, but I’m really tempted to just switch back to MyFitnessPal. I wish there was a free trial because I absolutely would not have wasted my money had I known about these issues. At this point I would not recommend it to anyone. I’m not much of a review guy.... BUT, I must say I am very happy with this app. I never liked its competitor(s) interface, however I found “my macros” to be very easy and perfect for me. The best part though, is that it has a small business vibe. There has been two occasions were my data has been lost, I’m not concerned with the why. However I’m very impressed with the how, and by how I mean how they resolved the problem. Mind you, I left the account dormant for a couple years, so it’s no surprise that updates happened or whatever else takes place in the app world. All I know, is both times I emailed, and both time Jason himself responded and found a way to correct and reload all of my saved data, much of which was manually input. SO... why?? I don’t know and I don’t care. All I know, is the app is good and nothing’s perfect, but IF there’s a problem I can count on them fixing it. And that’s all I can ask for from any professional. So thank you and yes I love and recommend this app over others. 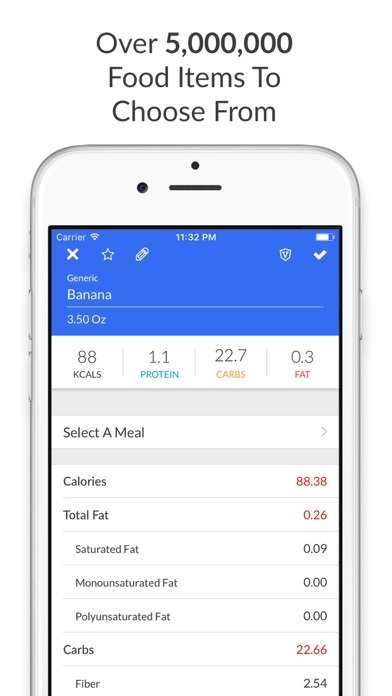 It’s a great app for those who know that calories don’t matter as much as macros. It’s simple and easy to use. Food data base is not as large as MyFitnessPal however the more people use it and I use it the database is expanded and a lot more accurate than MyFitnessPal. The new feature that was added a few weeks ago called Macro Coach is absolutely incredible! The feature consists on setting a goal, adding your current info and every week do a “check in” which will cause adjustments to be automatically done to keep moving forward to your goal. The more I use it, the more effectively it works. The only thing I wish is that the pace calculated by Macro Coach was according to fat mass instead of body weight. The reason is that the last few weeks I have been losing fat mass at an impressive pace BUT haven’t lost weight. If the pace is calculated just by body weight then the app will keep reducing my macros and calories regardless of making a lot of process in fat loss. I tried this app after trying MyPlate. I like that there is a lot of customization. I also love that I can enter any amount of servings and not be restricted to quarter amounts only. I love the recipe feature that allows me to create any recipe and reused it. There is a lot to love about this app, then why the 2 stars? Simple, time. It takes too long to enter in what I eat. Other apps can scan practically any product and report accurate macronutrients (I've seen discrepancies on this app that don't coincide with what I scanned). Navigation is also confusing and I find myself tapping having to tap quite a bit before getting anywhere. The app is also buggy. Sometimes scanned food appears and other times it doesn't. Searching is all but useful, I can't find generic items like Bananas and watermelon. I end up googling nutritional information for these items and creating custom items in the app. All these things add up to too much time. I'll use MyPlate, it doesn't offer as much customizations, but it is quick to enter my information. I've been using this app for over a year and with each update it gets improved. I love the barcode scanner though sometimes it doesn't recognize the barcode (hello just enter in macros from the nutrition label and it's saved!) the only critical feedback I have for the app is I wish it would calculate changes in nutritional value if you change something from grams/cup/oz/etc to another variable. It would just save time. And for carb cyclers if you could be able to enter different macro goals for the day and it would automatically change your goals for you. Sometimes I forget when my carb load day is (carb depleted brain anyone?) but if I was able to set a schedule for my macro goals it would make my life simple. However that is a stretch for any critical feedback, this app is awesome. This app is awesome! Super easy to use and navigate. I love that you can follow your friends to create accountability. The barcode scanner is a lifesaver. 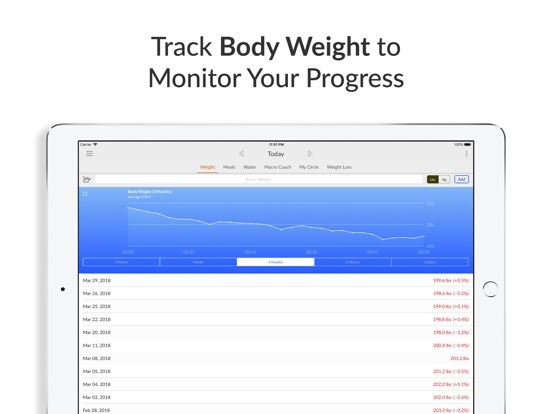 The update is awesome with more tracking options to keep you aware of what you are putting in your body. I have recently started tracking weight since I will be doing a reverse diet to make sure my weight doesn't fluctuate too much and want to start s tracking water intake as well so that I can become more consistent with that. My one complaint about the app is regarding the calorie total at the end of the day. It always seems to be off, sometimes by more than 300 calories, so just be sure to know what you are putting into your body instead of trusting all the math of the app. I have been tracking macros for the 5-6 years and used many Macro Apps in the past. I have yet to find an App that provides so many features. I enjoy being able to create my own recipes, manually log my foods, and look at each of the graphs analyzing my foods. I also like the joined My Workouts+ App. The App developers are also very professional and extremely nice when I sent an email with suggestions for copying/pasting links of websites with my favorite recipes. In addition, I’m wondering if there’s a way we can use our Smart watches, Fitbit, etc and have them sync so we have all of our information available: caloric intake vs caloric output (along with graphs that support this information). Thank you ! This app is almost good. At the bottom I’d recommend status bars or circles so that people can see their progress and how much further they have to go in order to achieve their macros. I love the social aspect so people can follow and I can keep up to date with my clients. I’d like to remove the Diet Coach tab because I won’t use it and it’s really just taking up space. Additionally, why can’t I track my workouts or calories burned with another app? I should be able to include calories burned and not be forced to use the macrosplus fitness tracker. Lastly, what about app themes? Making the application easier to look at will improve people’s desire to use it. Also, water consumption/weight should not be their own tabs.. It should be two buttons on the main page. All that is to say, the app is too spread out and could easily be condensed. I love this app because it is simple to do what I want: track macros. It offers more features, but I don't need or use them. I began tracking with this a few years ago, so my list of foods is built. Like any food journaling app, there is plenty of prep work but once you have your basics, it's a breeze. I use the custom food and recipe features most. I eat little packaged food because I do a Keto diet. I used it at first just to see how I was eating, not for goal setting. But this app has helped me get back to basics when I strayed now that I have my own benchmark for what balance of macros works for me. The developer was also responsive when I sent email questions. I highly recommend this. I have been using this app for a couple of years now. Every update seems to have some good improvements and I love that goals automatically sync to my Avatar Nutrition account - it would be great if the weight tracking did as well. Meal orders: requesting a default order option for meals to reduce having to reorder meals every day. It would be really nice to not have to do this all of the time. I do love that it gives you the option to name your own meals and add as many as you want. Food database: much better than it used to be, but the search results are weird sometimes. It can be difficult to find simple items. Recipes: a great feature, but a few issues here. There is no place to store instructions or notes for the recipe and when you go to add ingredients that are not in the database you have to exit, enter the ingredient as a custom food, and then go back and re-enter the recipe. Also, it would be nice to be able to enter the quantity when you add the ingredient instead of adding all ingredients first and then going back to update after the ingredient is added. My Circle: great feature, but still glitchy. I quite enjoy this app! I like how much more it focuses on macros and how much more customizable to your own personal macro numbers it is. When compared to its competitor, it has pretty much everything and then some! The only thing I miss from it is the ability to “sign off” a day and have it spit out to me an estimate on what I’ll weigh in a month based off of how I ate that day. I know it’s not accurate and is not necessary, but it’s something I looked forward to when using competitor apps, and it motivated me to do that great every day, or to do better tomorrow. It helped me keep my head on straight and look towards little goals. I hope my macros + adds that feature at some point! Then it would be perfect! Please Read! App has Potential! I have used the app for several days, the app has serious potential and is great but has significant short comings. I wish there was a more unique design as it feels they used MFP layout. But here are the main reasons for the low rating that frustrate me as a user. 1. The Database: this is seriously empty, there is hardly anything complete when I look through the database, almost everything I have to manually add. They should have used MFP database. 2. The Barcode Scanner: it has worked on maybe 2 items I have scanned, I tried to scan a lot of items and all but 2 came up with info. I was shocked that it found a "KIND" bar but nothing for "Quest bar". Really needs improvement. 3. Premium Upgrade Subscription: this is subjective to many people, I believe in supporting a developer. However I would have preferred to make another one time payment than to have this locked wall to use other parts of the nutritional settings. This app has amazing potential and could be the best Macro app in the store if the Database most of all is upgraded to include a lot of what MFP has in it. I love the Workout app that corresponds with this app, it's great! I wish the ability to use a different theme or layout could be made available such as a circle layout or something. Oof. This app has some user experience problems. Difficult to find the place to create an account, even though parts of it require an account. Menus are hidden inexplicably behind unrelated menus. Unlike MFP, you can't change the measurement size of the food you searched for? I put one tbsp of flax seed meal in my breakfast, and I'm supposed to enter that in weight, per ounce? Please don't make me have to stare at the back of a package doing math when similar apps just offer a tbsp option. There's a "Weight" tab to enter your weight and view a graph to track your weight loss, and there's a "Weight Loss" tab, which does nothing but prompt you to download another app. Macro charts and recommendations are impossible to find if you don't know where to look. I'm going to stick with this for a few weeks because it syncs with the Avatar Nutrition site, but I already miss MFP. Let me preface this by stating I have never submitted a review, ever! I purchased in order to track macros directly through Avatar and I am so disappointed. The interface is far from user friendly, searches render vast results with nothing to contribute towards what you are actually searching for. I expected to see where I am in my macros to get an idea of where I am and nothing. MFP is superior in this aspect. I believe people are looking for simplicity when it comes to figuring out tracking which is why they sign up for Avatar. Maybe you should take note and not give everyone fatigue in manually entering their foods, I mean looking up coconut oil produced ZERO results for oil but tons for mass produced products with coconut in them. This is a FAIL! The explanation provided by Avatar sold me on something you just don't supply. Please add a screen so we can see the tracking from the info provided once you link the accounts. Makes my life easier but a couple improvements would help. I use this all the time and love it!! It makes my life easier for sure. I especially love the data presentation. I LOVE, LOVE the barcode scan feature, but here are a couple items that need some improvement Export (please fix): I'm diabetic and wanted to store info about my blood glucose, events, activities throughout the day with my meals (all labeled by hours of the day). So I upgraded to the paid version to allow notes with meals along with the export feature in order to easily get this information for my Doctor. But only the Day notes exported-not the meal notes. AND, not every day's information exported-it missed 2 days in a 2-week period. Search: I wish there was a way to search meal ingredients within the meals that I eat (my customs or my meal database). I know I can access through customs/favs, but if it's listed by an odd first word in the title e.g. Organic...or by the brand, I have to look through lots of ingredients or search through the global database again. Database: ditto for me about the more complete database of food (already listed in a previous review). Please keep improving! I’ll start with the good stuff – being able to scan barcodes for basic nutritional information is a wonderful future. And the recipe builder has saved me a lot of time. Here is the big problem I found l, For which I docked it one star; when you look up a food from the master list, it will list the total carbohydrates for that food – but it won’t subtract carbohydrates from fiber, which don’t count towards bad carbs. So foods like avocados and flaxseed meal – which have a lot of carbs, but are mostly fiber - look like very bad choices, when in fact they are very good choices. The logic should subtract fiber from overall carbs. If they would fix that, and ideally come up with a desktop application that synced through the cloud with the mobile app, it would actually be pretty ideal. I've been using MFP for a few years. I thought by paying I would get something amazing since MFP was close to it. Wrong. 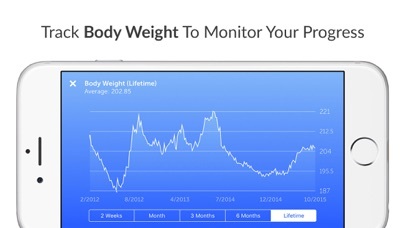 Great that it syncs to avatar nutrition, but it doesn't track your weight as well? Searching was not as easy as I expected. Recipes were difficult to create. Paid $2.99 for the app and $1.99 for online service. I really feel cheated. I hope it's just the conversion from one app to another that makes it seem so awful. Never should have paid for this app. Stick with MFP. Sure there are some annoying issues (not being able to put exact Macros), but this app is bare bones at best. I can't even change the serving sizes. So I have to search for someone who input the same amount I want to use which seems like a huge waste of time. I feel duped. Maybe I just need time to adjust, but it looks bleak at this point. I love this app for many reasons. 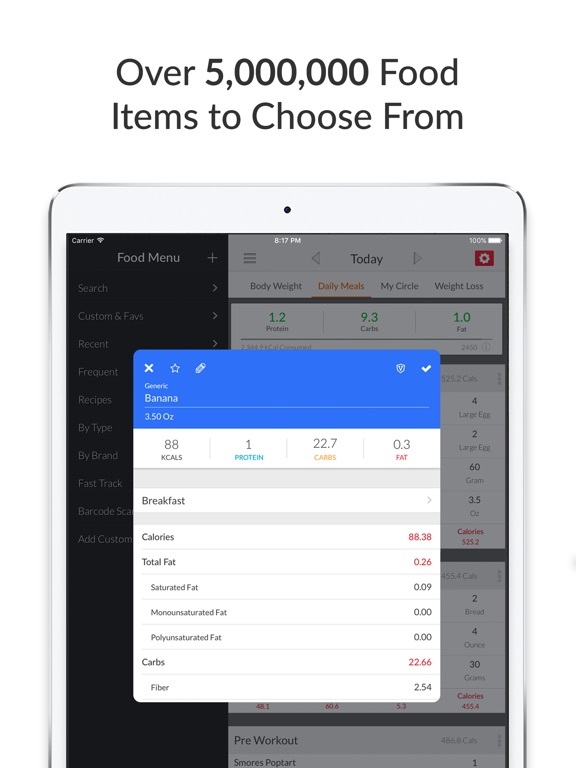 Tracking carbs and net carbs, tracking by mg and percent of calories, ability to quickly access frequently or recently used items, and the ability to add custom recipes are all great. Things that could be improved - searching for food items is often frustrating. The list could really be expanded and the search should allow for more specific terms so you don’t have to search through so many. The barcode scanner is really hit or miss which can be frustrating. And finally, I’d like to be able to enter a whole recipe and then select a portion rather than having to figure out the portion proportions manually. Overall, it's a great app(I'm looking at potential). I love that it allows you to categorize way more than MFP(pre workout, etc), but the search needs to be upgraded BADLY. I'm a personal trainer so I'm thinking more for my clients that have no idea how to really measure and track. The barcode scanner hardly ever picks up anything(I'm eating normal mass produced food), and when you search you have to write EXACTLY what you're looking for and it still won't find it some times(e.g you can't look up eggs because nothing comes out, I have to literally type grade a large egg and start looking.) You guys are on to something by allowing cross platforming with avatar nutrition and I see the potential just please keep making those improvements and the app will blow up for real. Thank you! After finally deciding to get back on track with a lifestyle change to plan for a healthy life after 55, I started working out again but this time I wanted to work smarter and harder. I looked into meal plans and such. Then I came across the study of macronutrients. Which, led me to My Macros+. 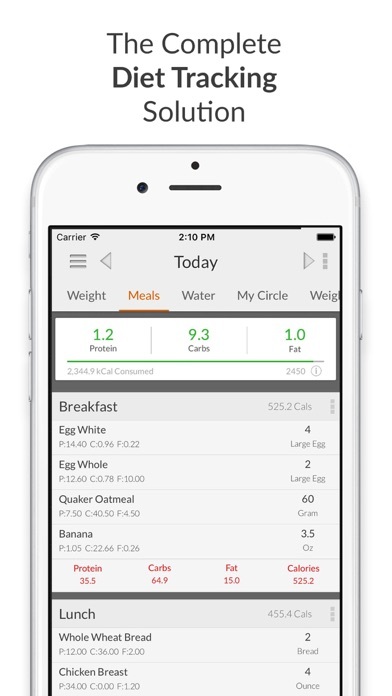 This app makes it so easy to track & understand, adjust & acknowledge each meal, each day. It's only been a week but it's been such a wake up call to see the wasted calories I was consuming regularly. While thinking I was eating healthy. Thank you for developing this powerful tool that makes eating & living better easier. I love how the app functions and have zero complaints about how you use the app. I use this app and its workout tracker counter part to track all my nutrition and fitness data. 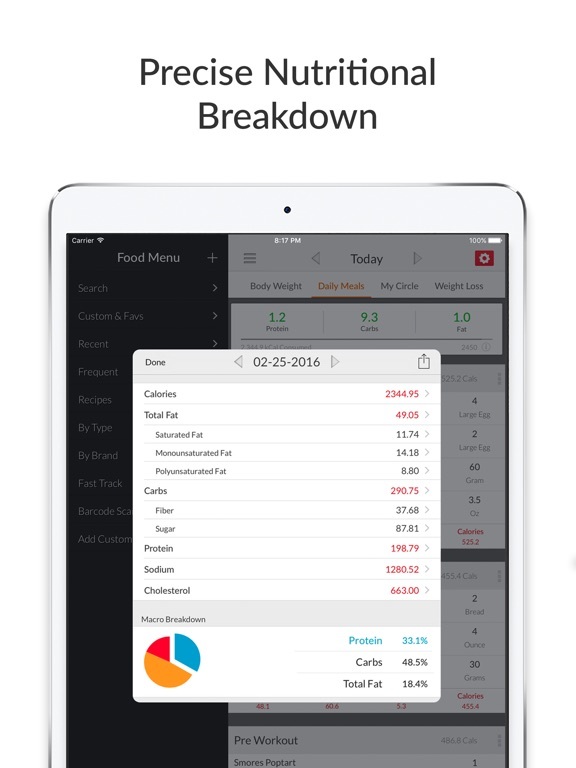 The only thing is that mymacros+ doesn’t sync its nutrition data correctly with Apple health. When I go into the Apple heath app it doesn’t display the correct amounts of my macro nutrients and will display protein amounts in the 10,000g/day range. I’m running IOS 11 on an iPhone 7plus. Hopefully this gets fixed soon. It would also be cool if the myworkout+ app exported estimated calories burned data to Apple health based on age, weight, height, and body fat. It’s not even close. For those who have the desire to accurately track their macros/micros this App is the best. I was so fed up by the mathematical errors and just flat out missinformation on MFP that I had to look elsewhere and I did not want to back to manual spreadsheets. Look no further! It’s worth the price for full functionality as well. Exporting into excel is breeze if you’re an athlete needing to send to a coach or just the detailed inclined. Having been a longtim user of MFP...it did take some transition or adjustment time. But after a week or two inputing some data I could not have been happier! Finally! A GREAT macro counter!! I've been counting macros for two years now with other apps, shifting how I enter and track to fit the app's limitations. Never again! 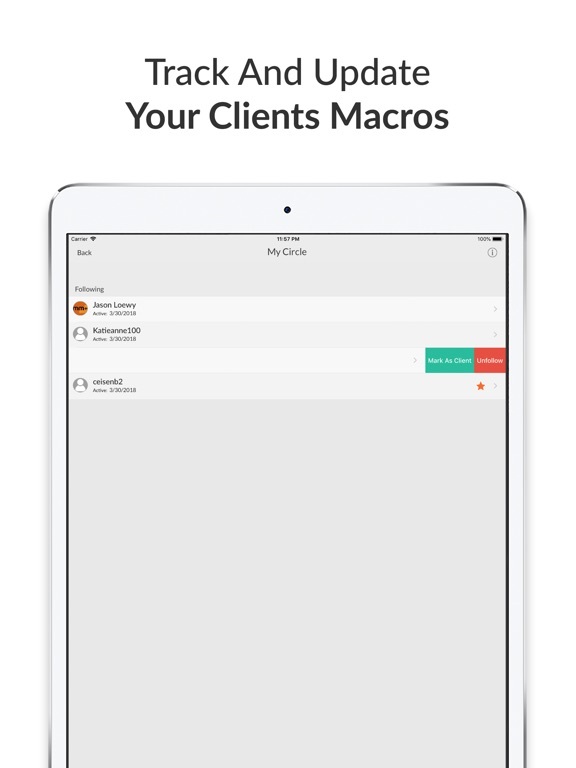 MyMacro+ let me set up different macro-goals for different days, it gives me very quick synching between my phone, iPad, Mac and PC, and so far I have not had any trouble with any platform I use. The barcode reader works well, and there are lots of helps to make you think your most frequent or favorite food and meals quick and adapt other entries as best for you. Go for it - and just do the upgrade right away, you get A LOT for a very small cost. It's okay. . .could use improvements. There are some parts of the app that I like, but the part I can't get past is the library of foods. It's a mess. A lot of brands I type in aren't in there and they aren't off brands. Also, when you do type stuff in, a ton of the same foods pop up and they are unverified. It pointless to have to sift through 30 foods that are all the same. That needs to be cleaned up. Additionally, if you type in coconut oil, there's is nothing. You type in oil, nothing pops up. No Kerrygold either. So if you're looking to use this to log macros for the Keto diet, look somewhere else. I had to uninstall this app. The macros app with an apple on the icon is way better and it's the same price. It seemed like a good thing except for the fact I paid to download, then realized it was only for a one week trial then paid monthly. Why can’t you give me one week free trial?? After downloading I realized it was a bit confusing but figured over time and use that I could figure the app out. I have decided rather quickly that I don’t like this app mainly based on the fact that I cannot find a single food item?! I mean I couldn’t even find a Starbucks drink?! Starbucks!! I searched on every part of the word with or without Starbucks in the search and I could not find it. This is just one example. I can search via MyFitnessPal app and find things almost immediately. Cancelling my paid trial and going back to my fitnesspal app. I have been a MyFitnessPal user since about 2012 when I wanted to track calories. While it has a section for tracking macros, I wanted an app that was dedicated to it. The mistake was paying $3 for something that doesn't have half of the resources. MyFitnessPal gives you micronutrient breakdowns, which this app (seemingly geared towards manly men) does not seem to think are important. If you ever eat packaged foods (i.e. fruit strips or a specific brand of cheese), good luck. It isn't there. This is silly, because both calories and macronutrients can vary incredibly between products produced by different brands. I've used WeightWatchers as well (side note: you'll be weak and tired if you're already pretty healthy), but the easiest thing is MyFitnessPal. It is the most efficient, useful, and FREE tracker I've found. Potential but misses on most marks!! Like other users here, I was a Myfitnesspal user and wanted something more in depth. While setting everything up I thought I made the right choice until I started using the food tracker. Like everyone here, the barcode was good for me but barely worked for my Wife’s phone. As I tried to input serving size data, NONE of the information matched. The more I edited it the more the calculations were wrong. I tried putting in serving sizes like cups, ounces, etc. and it was like it didn’t know how to compute it. Then, I put it down after frustration, closed it out and tried again the following day with the exact same results and even worse, it wasn’t even saving to my food log. In short, waste of money and time. Myfitnesspal is free and better on all accounts. 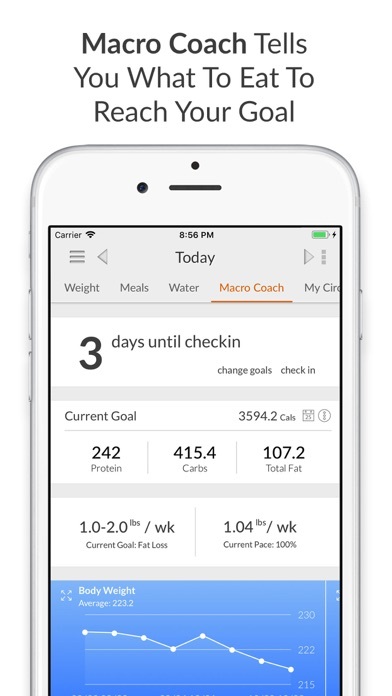 I love that you can set exact macro goals and save different macro goals in the app and apply them when needed. All for the upfront pricing, no monthly fee. Really the best feature that other similar apps don't have is the ability to enter in a new exact serving amount rather than working off of a fraction or decimal percentage of an existing serving. For someone who is serious about tracking this is a must. You also completely edit any item you've scanned into your app. This is especially nice if you want to change the serving units. This is by far the easiest macro/calorie tracking app I've ever used. It is easy to enter data, the barcode scanner recognizes almost everything, and if it doesn't, it is easy to add your own. There's a quick add feature in case you don't want to put in all the information. Recipe builder. It's very easy to look and see what something will add to your meal without actually adding it. Also, the app creators are very responsive if you have any questions and email them through the app. Definitely a five out of five stars! I love this app! It makes it easy to track my macros, weight, and water. I wish it were easier to input exercise into the app other than syncing with myworkout+. I find myworkout harder to track exercise and I don't use it regularly. If the app could sync with the iPhone exercise tracker, that would be ideal or find a way to simply input exercise (broad categories like cardio, weight training, etc. and level) to give you a better idea of calories burned everyday. Other than that-this app is awesome! Absolutely love it! It's really easy to use. The only reason I left out a star is that I wish their database for foods was much larger and that their search function worked better. I typically have to manually add the food to my "custom" foods for it to be easy to log. I also wish that deleting foods would be easier to do by being able to just swipe it left like you do on emails instead of having to click the delete foods option and then deleting from there and having to click the finish button. It's too many steps. Other than that I love it. I tried MFP first because it seems like everyone uses that but I didn't like it at all, I thought it was confusing and not user friendly. My Macros is the exact opposite, it's easy to use, it makes sense and once you get a solid list of favorites going it only takes a few seconds to input your meal information. I love how it shows me the F, C & P breakdown for each meal, it shows me the total I've consumed so far, the amount I have left as well as what my daily totals should be. I can track my weight too! I would love to give this app five stars. It is much easier to use than MyFitnessPal in my opinion, the database is amazing and pretty large and it's straight to the point( All I want to track is Macros and Calories. That's IT!!) My only issue is the calculation of calories and macros. It is extremely off. I spent almost and hour trying to figure out why my macros for lunch wasn't adding up to the calorie amount displayed. This leaves me conflicted. I love the app BUT it isn't reliable. I would love some support and help with this. And yes I made sure the nutritional information was correct for each food entry. The Calculations were still off. Ughhh! Pretty good bang for your buck! 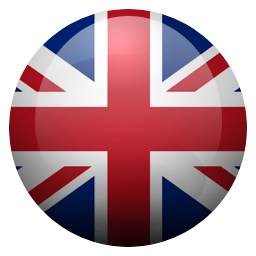 This application is super easy to use and customizable to your liking. You can quickly view the breakdown of macros you have left for the day, which makes it super easy for you to plan your meal choices. A lot of people rating this application with fewer than three stars seem like they're comparing this to My Fitness Pal, and saying that this application lacks a good database for processed food items. While it is true that the database lacks a robust food library, this shouldn't be that big of an issue. Firstly, you really shouldn't be eating a lot of processed food anyway, so why are you worried about this? Secondly, if you're truly too lazy to track your food intake manually, then perhaps you lack the motivation for tracking macros at all. Thirdly, this app costs three bucks. My fitness pal costs $50 a year. Idk about you, but I think I found a winner. I really like that I can adjust my macros since I do carb cycling. But this is pretty much the only feature I enjoyed. The barcode scanner never worked for me, even after creating a profile to access the larger database. It would have been nice to have different measuring options for items. For example, a banana comes up as 1 cup mashed vs. the way I usually eat a banana them - straight from the peel. Adding food was in general frustrating. After a couple days, I purchased a subscription to Lifesum, where I can adjust my macros and looking up food is way easier. Deleted the app after a few days. I’ve been using this app for macro tracking for about 4 months now and really like it. Straightforward, no fuss, macros only. I know lots of people that like MyFitnessPal and I tried that out for a while, only to switch back to this because it’s just so easy. Only minor complaint is that the list of foods in the database isn’t as comprehensive, but once I’ve gotten my regular and favorite items entered in I use those all the time from my favorites list. I recommend this app if you are looking for an easy way to track. Great App for Tracking Macros! I love the barcode scanning feature - this makes things so much quicker and more efficient. The search tool seems low in pre-loaded items you can find. For instance, Starbucks only shows one drink when I search the brand. The barcode scanner definitely makes up for it though! Also, it'd be nice to be able to apply different macros for different days rather than having to switch it for the entire profile (rest day vs. active days). 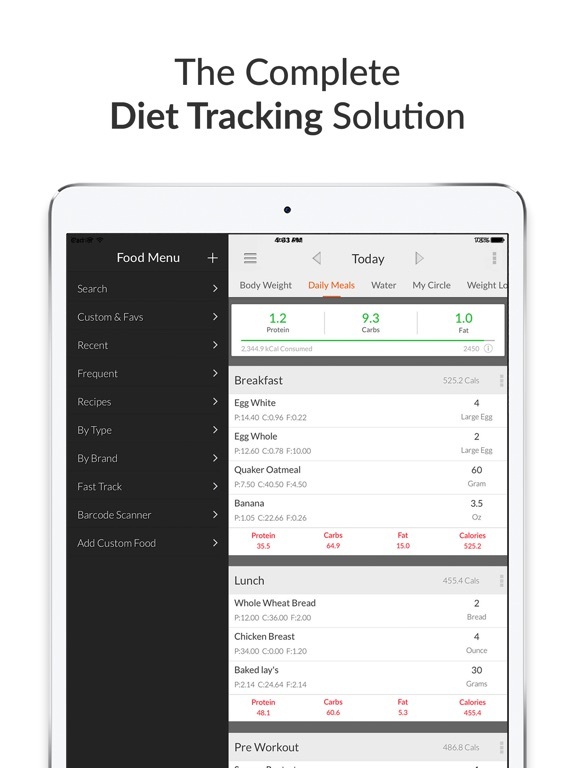 Overall, I LOVE this app and prefer it over MFP. Definitely worth the purchase. I literally can’t find anything I type in, even with global search turned on. I have to scan everything if I need to add it and sometimes I don’t always have the product. App has a ton of bugs, coincidently also while searching. First item is hidden by Serving Size and Brand filters, once an item is selected it’s pretty much frozen till you hit the back button. Cannot multi select when searching for items. The concept is there. Partial functionality is there. Unless you eat packaged foods or at restaurants all the time, you will still need another macro book. This does NOT have raw, fresh foods calculated. So if you are some broccoli, you will have to look up the nutrition unless it was green giant frozen broccoli. Are a fresh chicken breast? Again, not in the app. I have a macro book but was wanting the app for simplicity and to ditch my notebook records and go electronic. It’s actually more time consuming to use this app with the lack of foods in the program. Like I said, if you eat out or get pre packaged foods and not fresh produce and meat items, you will probably like it. 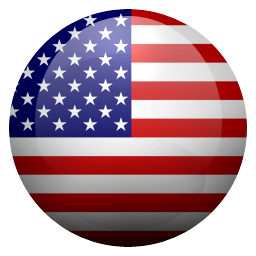 A great app for Macro focused tracking. Your macros are prominently displayed at the top while showing amount left throughout the day. Very intuitive for me. I switched over from MyFitness Pal for this reason. Only reason I didn’t give it 5 Stars is, because the food database isn’t quite as extensive as I was hoping. However, the bar scanner usually picks up what I have. If you do have to enter it manually it will stay in your personal database then you can always use that entry; so that’s nice. Definitely recommend.